The celebration of the 100th-anniversary year of Debussy’s death with his music, on July 11th at the neo-Renaissance Vanderbilt mansion in Newport, touched on nostalgia of more than one strain. Nostalgia for a splendid Italian past inspired the celebrated architect Richard Morris Hunt to design a 70-room palazzo for Cornelius Vanderbilt II reminiscent of the 16th-century palaces of Genoa and Turin. Beginning in 1893, Hunt directed an international team of craftsmen and artisans to execute his ambitious plan. Sitting on expansive lawns and gardens overlooking the ocean and the famous cliff walk, “The Breakers” seems unmindful, in its stony glory, of the dignified and nostalgically Williamsburged, 18th-century New England clapboard port it surveys. 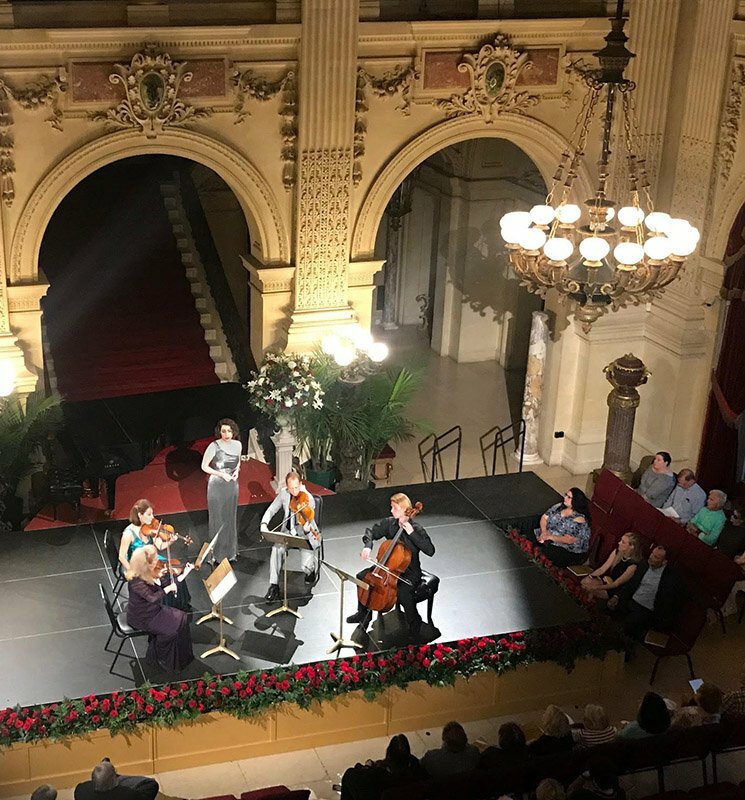 Now in its 50th season, the Newport Music Festival sponsors a series of chamber concerts (among other venues) at The Breakers and two neighboring mansions, The Elms and Ochre Court―ideally intimate spaces for the performance of rare and familiar repertory by a corps of 50 both seasoned and emerging artists. In Les Chansons de Bilitis. Traduites du grec pour la première fois par P. L. (The Songs of Bilitis. Translated from the Greek for the first time by P. L), published in 1894, poet Pierre Louÿs indulged in two forms of nostalgic deception. The prose poems were inspired by Meriem bent Ali, a young Arab woman who had been the lover of three friends and associates: André Gide, Paul Laurens, and Louÿs himself. Replete with references to ancient literature as well as to contemporaneous poems by Baudelaire and Swinburne, the poems were passed off by Louÿs as translations and accepted as such by eminent classicists; in fact, he composed them himself. The supposed poet Bilitis, alleged lover of Sappho on the island of Lesbos, was another creation of his imagination. This elaborate exercise in what Cashman Prince has called “inverted philology” emboldened Louÿs to depict forbidden loves in frankly sensual language. Debussy set three of Louÿs’s prose poems for voice and piano in 1897-98, giving the first performance in March 1900 with the soprano Blanche Marot and himself at the piano. In 2017 the composer Jake Heggie arranged them for mezzo-soprano Joyce DiDonato and the Brentano String Quartet, and it was this version that opened Wednesday night’s program. Renée Rapier has a richly sonorous voice with the velvety tones of a true mezzo and considerable dramatic power throughout her wide range. Mellifluous tone quality, however, sometimes obscured the pure French vowel sounds and articulated consonants that could have better projected Debussy’s recitative-like setting of “La Flûte de Pan” (The Pan-pipes), a metaphorical description of a young girl’s initiation into the rites of love-making. Rapier’s dramatic gifts found their scope in the more passionate middle song, “La Chevelure” (The Hair) with its expanded vocal range and accelerated rhythms. In “Le Tombeau des Naiades” (The Tomb of the Water-Nymphs) the flexible recitative of the voice contrasted with the slow but unrelenting 16th notes of the accompaniment, spelling the girl’s resistance to the harsh realities of love. Renée Rapier and the quartet of top-notch string players assembled for the occasion complemented one another in their sensitivity and attention to expressive detail. Its title suggested by the 18th-century painter Antoine Watteau’s L’Embarquement pour Cythère, Debussy composed L’Isle joyeuse (The Joyous Island) during the summer of 1904, an idyllic period spent with Emma Bardac, who later became his second wife. An exuberant exploration of interrelated themes that expand diatonic harmony to include whole tone, acoustic, pentatonic, and chromatic scales, it opens with a whole tone cadenza, proceeds through two different waltz themes and a fanfare, and returns triumphantly to a final tonic in an expanded A major. Pianist Daniel del Pino was more than a match for Debussy’s virtuosic display piece in all its rhythmic and figural complexity, although one could have wished for more nuanced dynamics amid an overall “loud-and-fast” presentation. Paired with cellist Sergey Antonov, del Pino adapted his playing style to the more classical mood of the Sonata for Cello and Piano from 1915. The opening Prelude began with a resolute assertion of D minor that gradually became more animated, followed by a romantic second theme and quiet conclusion. Terse pizzicato took over in the second movement, ironically named Serenade. Gamely turning his instrument into a bass guitar, its angular motifs interspersed with brief bowed passages, Antonov conveyed the mood that Debussy himself dubbed “Pierrot angry with the moon” with verve and conviction. The Finale followed without pause, its vigorous rhythms punctuated by an impassioned cello recitative. In his much earlier (1893) Quartet in G Minor, opus 10, his only work with both an opus number and a key designation, Debussy fused cyclical and variation forms, the opening theme providing material for three out of the four movements. The incisive opening motive, a strongly profiled upbeat/downbeat falling 2nd, reappeared in many guises. In the scherzo-like second movement, it was transformed into an ostinato pizzicato against a lyrical melody in the first violin. The motto theme gave way to song-like, lyrical expressivity in the third movement, particularly in the many soulful passages for viola. After a slow introduction, the Finale gradually increased in tempo as well as in rhythmic and textural density to its animated conclusion. The members of the “ad hoc” quartet―Stephanie Chase and Irina Muresanu, violins; Luke Fleming, viola; and Sergey Antonov, cello, all of whom perform widely as soloists as well as with other ensembles―delivered a wonderfully coordinated and thrilling reading. Thanks to the Newport Festival’s new director, Pamela Pantos, for offering us such an exceptionally satisfying program.